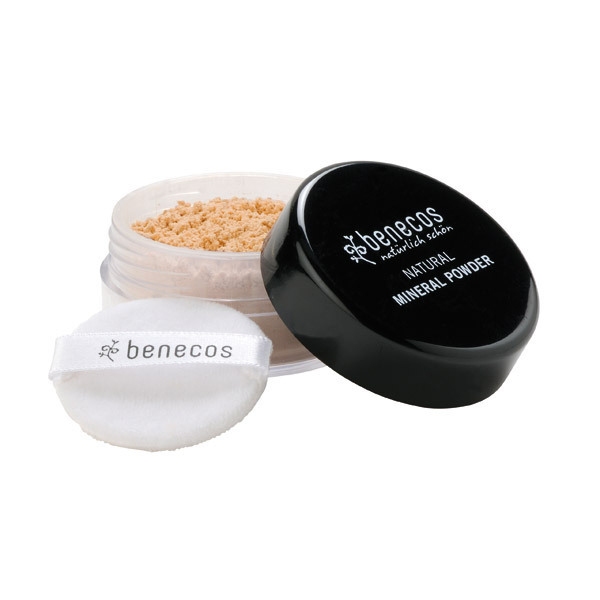 This natural mineral powder in sand shade offers pefect coverage of imperfections and a brighter smoother complexion! Powder comes with a sponge. 10 g.
- Kaolin absorbs excess sebum, soothes the skin and a matte complexion and without talc! - Ingredients (INCI) : MICA, ZEA MAYS (CORN) STARCH*, Kaolin, Octyldodecyl STEAROYL Stearate, GLYCERYL CAPRILATE, Levulinic ACID, p- anisic acid, sodium levulinate , tocopheryl acetate , GLYCERIN , AQUA , Oryza sativa ( RICE) HULL POWDER , BAMBUSA ARUNDINACAEA STEM POWDER , CI 77891 , CI 77492 , CI 77491 , CI 77499 , CI 77007 . - For additional coverage apply the concealer or foundation then for a perfect finish add the natural loose mineral powder for a matte finish. - To apply using the enclosed sponge or a powder brush. The sponge is machine washable at 40 ° C.
Discover the new range of cosmetics; Benecos shower gel, shampoo, body lotion, day cream and hand cream. Packaged in convenient tubes, they will add a colourful touch to your bathroom! Benecos is the brand for all make-up and beauty lovers, with a range of inexpensive natural Skincare, Cosmetics and Gift Ideas, why not simply to treat yourself to quality affordable products!